The butterfly will be animated outside of the frames and run throughout the video. Here is where you will look for information on RS Trailer Project. After opening the Animate file and downloading the Frame PSD you will want to import the PSD file to your library. 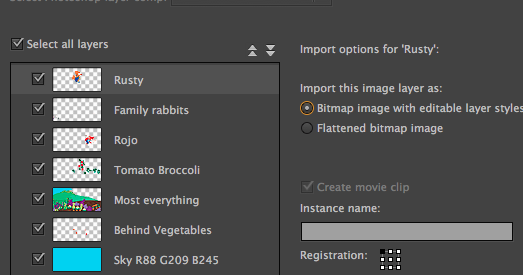 During the process you need to check "Bitmap Image with editable layers". This will enable you to maintain the original layers. ​Then you will zoom all, select the free transform tool and with shift held down fit the image to the stage as far as width. Then move the image to the bottom of the screen. If there is sky in the image try to match the stage to the color of the sky. Choose to retain layer structure in PSD. Here is where we will post the most recent version of the overall Animation. We will try pans and zooms. The timing will evolve. You will want to look at what things should move. Also look at the Wahman style which can be discovered by playing the previous videos below so we can maintain the style.